The scene is set for Sunday's Live Medal Races at Sailing World Cup Weymouth and Portland after a 20:15 finish saw the leaderboards in the ten Olympic fleets shape up nicely for the finale. After a frustrating three days for sailors and officials alike, a good chunk of racing was completed in a light southwesterly breeze ranging from 6-10 knots. Gripping battles ensued across each fleet and the fight was on to make the top ten for a place in the Medal Races. The competition is still wide open in each fleet so it's all down to Sunday's deciders. The Medal Races at Sailing World Cup Weymouth and Portland will be broadcast live from 10:00 to 15:00 UTC. New Zealand's Alex Maloney and Molly Meech enjoyed the best of the day in the 49erFX, sailing at the front of the pack in all three races. A first, second and a third has pushed them up to the final podium spot, seven points off leaders Charlotte Dobson and Sophie Ainsworth (GBR) who took two bullets and a sixth. The 49erFX were the first fleet on the water on Saturday and Meech was relieved to get some good competition in, "On the first day we took a long time to warm up and get some racing practice in and then we have been waiting so long on shore that both of us have been getting really competitive and been dying to get some races in. They need to overturn seven and five point deficits over the first placed Brits and second placed Swedes, Julia Gross and Cecilia Jonsson, to truly nail it. Whatever happens though, the trip to the London 2012 Olympic venue has proved beneficial. Meech concluded, "It definitely wasn't the Weymouth that we were hoping for with the wind, but any type of racing with any structure is beneficial and we have learnt a lot. The 49er fleet started to reach the shore at 20:30 as the sun set. New Zealand's Logan Dunning Beck and Jack Simpson reached the shore the happiest team after four races and will wear the yellow bibs in the Medal Race. They are eight points clear of Poland's Lukasz Przybytek and Pawel Kolodzinski. The Medal Races in both the Men's and Women's 470 will be winner take all showdowns with the top two in both fleets equal on points. Luke Patience and Chris Grube (GBR) and Jordi Xammar and Joan Herp (ESP) sit level on 24 points apiece in the Men's division. Both teams will have to tread carefully though as Sime Fantela and Igor Marenic (CRO) are ready to pounce, six points off the leading duo. Switzerland's Linda Fahrni and Maja Siegenthaler recorded an 8-1-2 scoreline on the penultimate day in the Women's fleet to lead on 20 points. They are joined on 20 points by Hannah Mills and Saskia Clark (GBR). Amy Seabright and Anna Carpenter (GBR) are eight points off the leaders. The 2016 Women's 470 World Champions, Camille Lecointre and Helene Defrance (FRA), won a pair of races on the day with a blackflag score line sandwiched in-between. They are forced to count the BFD after two false starts earlier in the week. They make the Medal Race but are off the pace for a podium finish. Germany's Toni Wilhelm will take a three-point lead over Chunzhuang Liu (CHN) into the Medal Race after another solid day of races. Wilhelm has remained consistent across the nine race series and a 2-4-3 on Saturday gives him the advantage over Liu who sailed well, picking up two bullets and a third. Wilhelm will be up against 2015 Olympic Test Event winner Aichen Wang (CHN), who is 12 points off in third, so will feel comfortable with the work done so far but a golden finish will round things off nicely. China's Peina Chen continued her run of race victories in the Women's RS:X, making it eight straight. She will take a ten-point lead over Emma Wilson (GBR) into the Medal Race with Isobel Hamilton (GBR) a point off her compatriot. Marit Bouwmeester (NED) pulled clear in the Laser Radial, remaining consistent with a 5-5-4 and takes a 13-point cushion over Mathilde de Kerangat (FRA) into Sunday. The French racer had somewhat of a mixed day, winning two races, finishing 25th in the other. She discards the 25th and is on track to pick up a medal. Emma Plasschaert (BEL) completes the podium with only the double points race to go. Tom Burton (AUS) lost his lead in the Laser for the first time this week after three tricky races which saw him post a 9-12-9. However, Burton is a single point off of Nick Thompson (GBR) meaning that whoever beats who, could win the war. Elliot Hanson (GBR) is seven points off the leading Thompson in third. Guatemala's Juan Ignacio Maegli picked up two race wins, finishing 25th in the other, and is seventh overall. 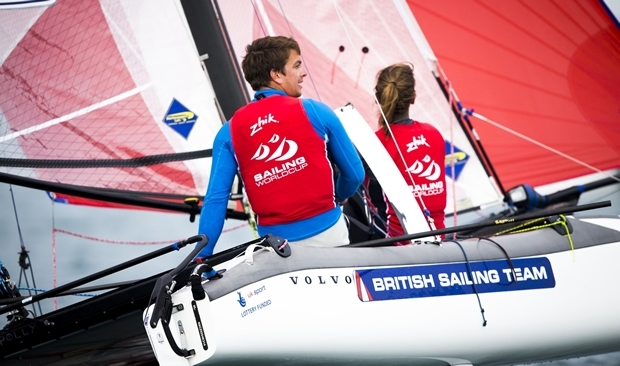 Ben Saxton and Nicola Groves (GBR) put in a perfect performance in the two Nacra 17 races, winning both. They go into the Medal Race seven points clear of Paul Kohlhoff and Carolina Werner (GER) who, with finishing in the top ten and no other German teams making the Medal Race, have booked their spot on the Rio 2016 start line. World #1 pairing Vittorio Bissaro and Silvia Sicouri (ITA) occupy third overall with Billy Besson and Marie Riou (FRA) keeping them close company a point behind. Giles Scott (GBR) made the single Finn race count, winning it comfortably to regain top spot. Scott weaved his way through the fleet, working his way up from seventh place at the first mark to first at the conclusion of the race. The Briton leads on nine points and is just a single point clear of his compatriot and training partner Ben Cornish. Max Salminen (SWE) is in the final podium position on 13 points and Jonathan Lobert (FRA) is fourth on 14. It's all on for Sunday's Medal Race with the top seven all in with a realistic shot at finishing on the podium.